Following are the Frequently Asked Questions about TweakBox app. If your question is not listed here, you can leave a comment below and we will try our best to answer it. Alternatively you can Join us on Facebook and engage in a discussion there. 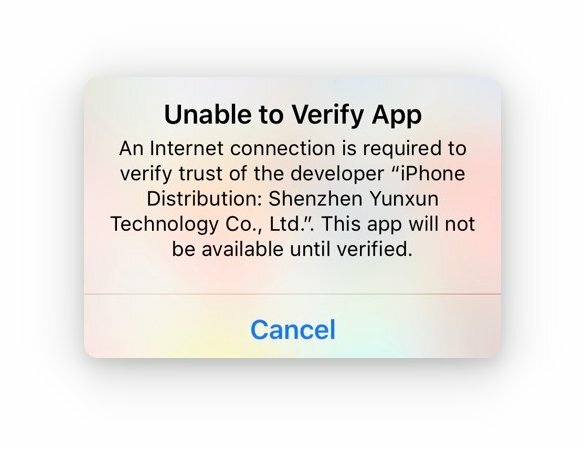 If you get this Untrusted Developer message when you try to run TweakBox, you just need to tell Apple that the app is from a trusted source. To do this follow the information below. The installer should now run as expected. Will My Warranty Be Void If I Install TweakBox ? Absolutely not. There is no way for the TweakBox app to void your warranty because it isn’t breaking any of Apple’s rules. However, should you choose to install one of the Cydia tweaks included in TweakBox, that could result in your warranty being voided. If you need to take your device into an Apple store for any reason, simply delete the tweak first. TweakBox is a third-party app store that is home to thousands of apps and games. Some of these have been modified with additional features, including the in-app features that can work out expensive. All of this comes to you without the need to install Cydia, making TweakBox incredibly versatile and open to anyone to use. We don’t condone piracy and the suggested use for TweakBox is to try out apps and games before purchasing them through the official channels. We can assure you that TweakBox is Free to use though and always will be. Is TweakBox Safe To Use ? TweakBox is an incredibly safe app to use. It may be an unofficial app but the developers have ensured that it is 100% safe for you to install so long as you do so from the official website. If you use unofficial sources, you run the risk of downloading malware onto your device. How Do I Trust the TweakBox App ? How Do I Uninstall TweakBox ? How Do I Download TweakBox On Android ? Can TweakBox Be Installed on a Laptop ? Can I Download It On a PC ? Yes, installing TweakBox on PC , Laptop or a Macbook is same, using an Android emulator like BlueStacks and the TweakBox APK file. TweakBox doesn’t need you to use any ID or account, you can simply download any app or game you want straight to your Mac or PC with just a few simple steps. Close Settings and you are all done. The reason behind this is that Apple has revoked the app certificate. Because TweakBox makes use of expired enterprise certificates, it will crash when the certificate gets revoked but they do usually update with new certificates. If you can’t download or verify TweakBox, the developers have not yet updated so delete TweakBox from your device and try again in a few hours’ time. Alternatively, like us on Facebook and click Following > See First for all the attest developer updates. You will also find this happens if you attempt to download a ++ app without removing the stock version. If you want to use a ++ modified app, you need to delete the stock app first to avoid conflict. What is MovieBox App ? MovieBox app is one of the best apps for streaming movies and TV shows. It offers access to thousands of different movies, including the latest offerings, and a section for HD movies only, along with all the TV shows you could possibly want to watch. You get the choice of streaming or downloading but you should note that P2P torrents are used for streaming. Is MovieBox Legal to Use ? Not really, no. Streaming movies or TV shows without permission from the official owner is illegal and MovieBox has not obtained the right to use or distribute any copyrighted material. The chances of you actually being caught using it are very slim but the risk is yours when you choose to download it. Is MovieBox a Virus ? No, it isn’t. There are some people who think it is because it isn’t entirely legal to use but you can rest assured it is completely safe to use. MovieBox will never infect any of your system files and it will not damage any of your data. Can I Download Emulators Onto My iOS Device ? In technical terms, no games emulator is designed to work on any iOS device. However, with Cydia, we could do it. Now Cydia is not required to install these emulators and you can find a number of them in TweakBox app installer, all of which work well on all iOS devices. Are Games Emulators Safe ? Yes, but you should cover your own back by using a tried and tested virus scanner after you download the emulator. You should also make sure that your emulators are only downloaded via official sources, such as TweakBox. There is one thing to note with an emulator – while they can be legally used, the ROMS cannot. What Is an Emulator Used For ? Emulators are bits of hardware or software that are used to make one system act as though they are another system – these are called the host and guest systems. The host is used by the emulator to run software or use a device designed to be used with the guest system. With TweakBox, the emulators will let you play games that are designed to be played on games consoles. The most likely cause is that the certificate has been revoked, causing the app crash. Wait for a few hours and then try again; the developers will have updated the certificate and it will all work properly. Yes, via the Twitter account for the developer. There are no guarantees that they will honor the request though as they do get inundated with requests every day. Delete TweakBox or the relevant app and install it again. May i know whn can i uodate the latest pokemon go…how to update? Thank you for your comment Ryland. We are in the process of upgrading the PokeMon Go Package. We will update you soon. To get updated , follow us on Facebook. When will you guys fix tinder and a few others that will not launch without updating? please update tweakbox , we got them covered already . have always enjoyed checking out your tweakbox site. When will the Sims mobile hacked receive its current update? Sure we will look for the developers who have cracked them. it was revoked and now its been restored. remove and re-download again please. Hi, I’m trying to download some games but they’re not installing. I’ve tried Golf Clash, Real Racing 3, FarmVille etc. The only thing I’ve been able to successfully download & run was The Sims Mobile. Ive deleted the profile. Restarted phone multiple times. Nothing works. I’ve been having some issues where the games I downloaded on Sunday 11/4/18 were revoked yesterday, I deleted and tried to reinstall them, but now when I do all I get is a grayed out icon with “unable to install app”. I have deleted the profiles, reset network, tried airplane mode and the same thing, they were working fine on Thursday, 11/8/2018. Why are they not installing? Hello I’ve tryed to download this app it works but when I try to trust it I don’t get the jkbao thing I only get the app. Can tweak box brick my iPhone? absolutely never. it only installs a profile. no playing around with system files. put this on macbook when i try to download apps it says unable to download itms services and fix to this? I have a probleme when i install forward assault. He is downloading and stop for no reason at the end. The icone is white. If can i give your a screen or video tell me. First thank you for this great app. My question is in the iSpoofer app pokemon go can you use berries or other items? Do I need to subscribe to the iSpoofer site to use them and get the access code from them? When I try to use them they do not work. sorry about this. we only host the app from the developers. how it works is beyond our control. hi, this is because tweakbox apps were revoked. We are trying to get it back ASAP, but they keep on revoking. We are trying our best. Hello. So I recently tried reinstalling spotify+ on my phone but it didn’t work. I deleted tweakbox and the profile. when I tried reinstalling instead of saying that it wanted to open settings, it just said that it was trying to download a configuration profile and that I had to approve but nothing else. I’ve already tried clearing the app data and history, but tweakbox still doesn’t install. what should I do? Sim, foi revogado algum tempo atrás. nós estamos nisso, e vamos consertar isso o mais cedo possível.